Freeland: "Canada does not view trade surpluses or deficits as a primary measure of whether a trading relationship works." WASHINGTON -- The Canadians may be characteristically polite as they carry out negotiations to amend the North American Free Trade Agreement, but apparently they won't be pushovers. In a briefing following the opening day of NAFTA talks Wednesday, Foreign Minister Chrystia Freeland forcefully pushed back against two key U.S. negotiating objectives regarding trade deficits and rules of origin. Hours earlier, U.S. Trade Representative Robert Lighthizer complained in harsh terms that NAFTA had been a job destroyer and needed a major overhaul, while his counterparts talked in positive terms about modernizing the 23-year-old agreement without harming existing economic benefits. He reiterated the Trump administration's interest in narrowing trade deficits, pointing to a $57 billion (all figures in this story in US dollars) shortfall with Mexico and even calling out Canada for cumulatively exporting $365 million more in goods than it imported over the past decade, despite overall bilateral trade being almost perfectly balanced last year. Freeland rebutted that view, saying those numbers fail to give a meaningful picture of the trade relationship. 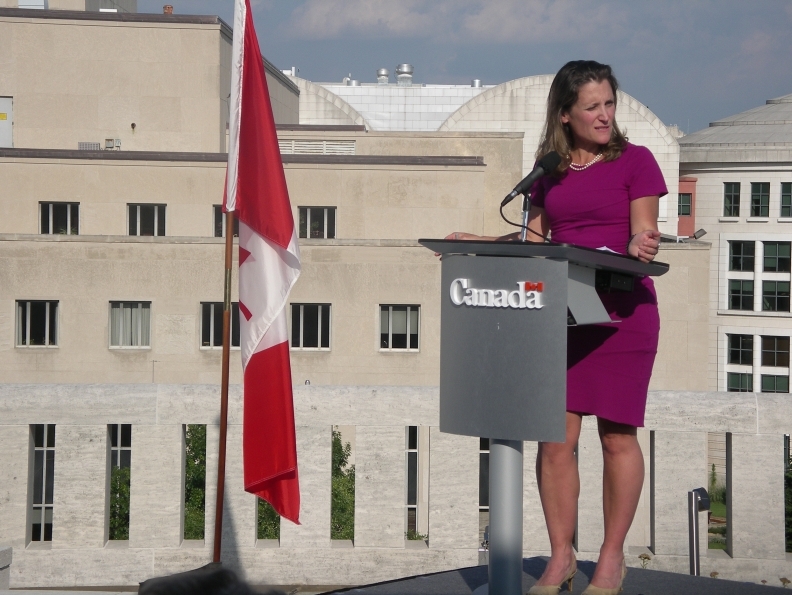 "Canada does not view trade surpluses or deficits as a primary measure of whether a trading relationship works," she told reporters at the Canadian Embassy here, with the U.S. Capitol as a backdrop. She noted that the United States had an $8.1 billion trade surplus with Canada in 2016 and that a holistic view of trade includes services, an area where the United States dominates. "Services are an essential and growing part of the 21st-century economy," she said. "It's important to include them in any measure of a trade balance." Excluding Canadian energy exports from merchandise trade, the United States actually runs a $26.5 billion surplus, while in manufactured goods, the United States has a $34.2 billion advantage, she noted. The foreign minister also dismissed Lighthizer's insistence that the United States will seek "substantial" U.S. content requirements in addition to a higher regional content requirement to qualify for duty-free trade. "Canada is not in favor of specific national content in rules of origin," she said. In the auto sector, 62.5 per cent of a light vehicle's value must have North American content to avoid duty when crossing one of the land borders. Mexican officials have suggested they could entertain a small bump in the regional content requirement but find national content requirements unacceptable. "We are very aware of the extreme complexity of rules of origin, and it's going to be very important from a Canadian perspective to take very great care in any changes that are made to ensure that they don't disrupt supply chains," Freeland said. Automakers have warned the Trump administration that any changes to rules of origin could upset a manufacturing ecosystem that depends on a closely choreographed exchange of parts and supplies between vendors in all three nations that efficiently add value to components before delivery to the assembly plant. "We do not believe that changes to the NAFTA auto rules of origin alone will accomplish a goal to increase employment here in the U.S.," Ann Wilson, senior vice president for government affairs at the Motor & Equipment Manufacturing Association, said in a statement. Freeland reiterated that Canada's priorities are to maintain NAFTA's ability to drive economic growth, cut red tape and harmonize regulations, and make it more progressive with regard to labour, gender and indigenous peoples as well as environmental protection.